JAI (1F50) will demonstrate its prism-based RGB colour line scan camera, the Sweep+ SW-4000T-10GE, based on a backwards compatible 10GBase-T GigE Vision interface delivering 10Gb/s output. The camera is backwards compatible to NBase-T (5Gb/s and 2.5Gb/s) and 1,000Base-T (1Gb/s). 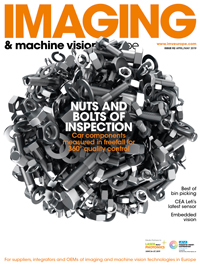 With a resolution of 4,096 pixels per channel and a maximum speed more than 100kHz, the camera is designed to cover a wide range of industrial line scan imaging applications. 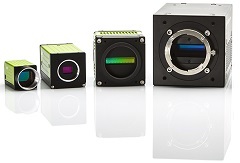 JAI has added a new high-speed trilinear CMOS colour line scan camera – the SW-4000TL-PMCL – to its Sweep series camera family. It features 4K (4,096 pixels) resolution and a maximum full line rate of 66kHz for 24-bit non-interpolated RGB output. Features include horizontal and vertical binning, built-in colour space conversion functions, as well as direct encoder connection and auto-detection of scan direction. JAI will also launch a new polarisation area scan camera in the Go series, built around Sony’s 5.1-megapixel IMX250MZR CMOS image sensor with a four-way polarised filter design.